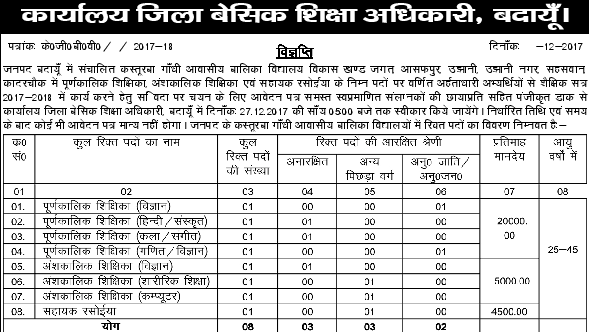 UP Kasturba Gandhi Balika Vidyalaya in Badaun Districts :- Candidates will be kept for 1 year only after that they can debarred without any notice. Name of the Posts: Science Arts, Sanskrit, Math’s, Computer and Physical Subjects. Salary: Rs 4500 to 20,000 per month. Name of the Organization: Uttar Pradesh staff selection board. Number of Vacancies: 50 Posts. Districts: Pilibhit District, Ambedkar Nagar, Shahjahan pur Pratapgarh District. Important dates: Last date to apply: 15-7-2016 some vacant posts was not filled you must contact given address to see some posts.